With an area of 701 km2, Menorca is the second largest of the Balearic Islands. Menorca is located approx. 35 km north-east of the larger island of Mallorca. 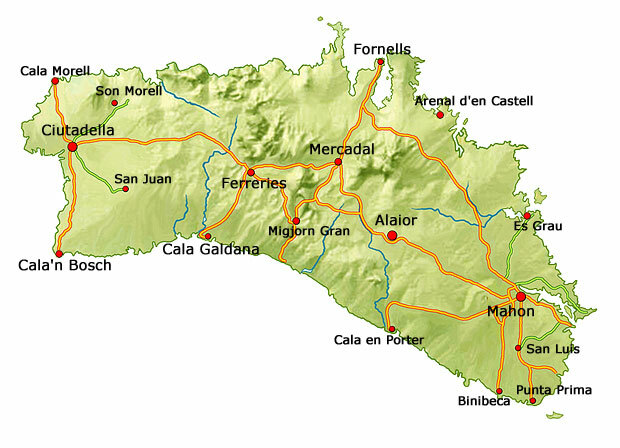 The map shows the former capital Ciutadella on the west coast of Menorca, whereas the present capital Mao is located on the east coast. Mao has one of the deepest natural harbours in the world, so this is where all the big cruise ships come in. The most popular holiday resorts are located on the south coast, whereas the very popular seaport Fornells is located in the north-western corner. Fornells is particularly known for its fine sea food restaurants where you can order lobster among many other delicacies.